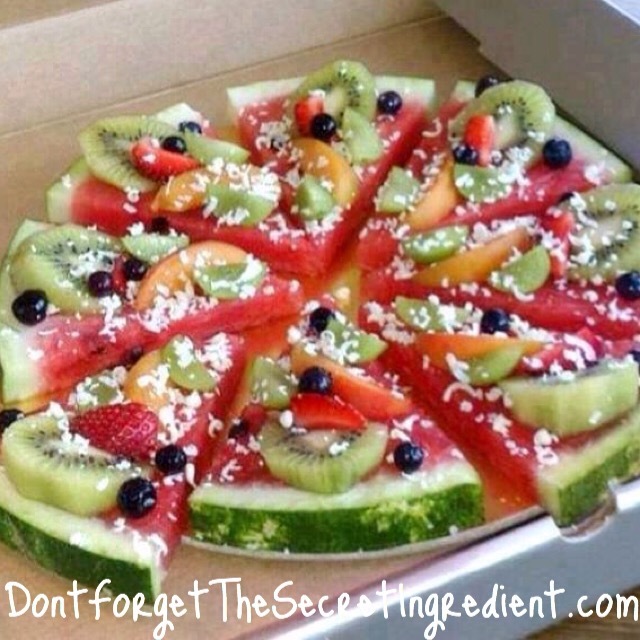 Can’t wait until summer to have this pizza! Packed with vitamins and minerals, this Fruity Pizza is the bomb. The Watermelon “crust” is full of nutritious benefits. It is a high lycopene food. Lycopene is especially important in cardiovascular health and an increasing number of scientists are finding that it is beneficial in bone health too. It also has amino acids known to promote strong kidneys and other organs. The Kiwi topping is one of the healthiest foods. It has the equivalnet vitamin C of an orange and its available year round. The California crop is from November thru May and then we get them from New Zealand. Their crop hits the market June thru October. Kiwis are a great source of dietary fiber and also provides great antioxident protection. Blueberries are full of nutritious benefits as well. Chock full of vitamins and minerals like vitamin C, vitamin K, iron, calcium, potasium and magnesium, these colorful fruits make a great pizza topping that is good for you and your body. Dried shredded coconut not only adds fiber, it adds iron which helps with healthy circulation and tissue maintenance.